Disneyland. The sweet smell of vanilla as you walk down Main Street, the smell of freshly popped popcorn and cinnamon sugar from the churros filling the air and of course the Mickey pretzels on every cart. Do you eat everything in sight especially if you have been “good” and making good choices because hey, you are on vacation and you deserve it?! 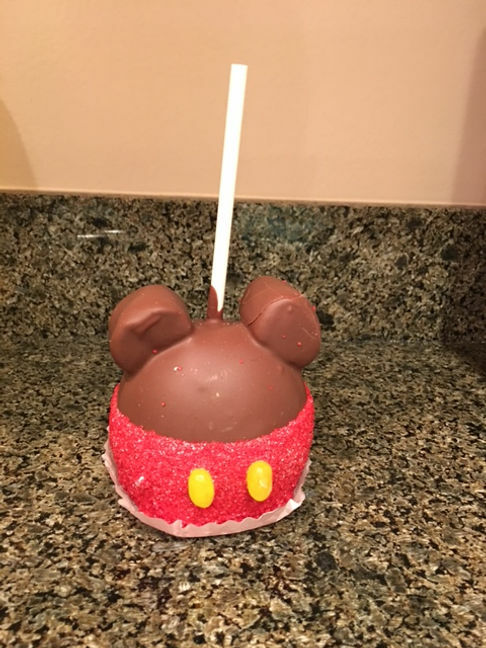 What I choose to do is if there is a treat or a snack that I really want is enjoy that treat or snack, usually a candy apple or a caramel apple. 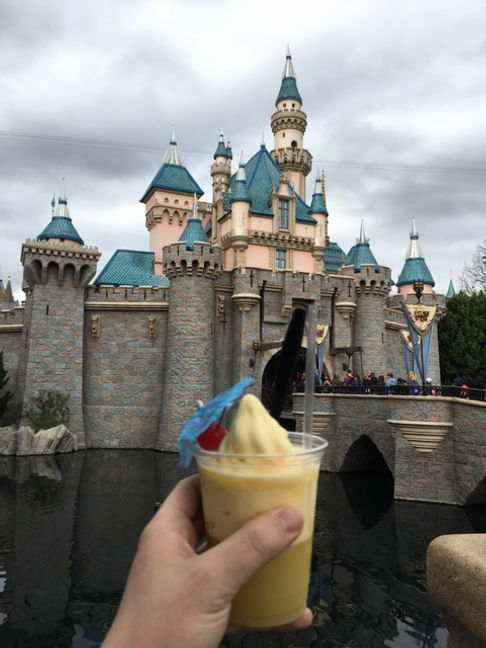 I have rounded up some of my favorite healthier treats and snacks at Disneyland that I love and enjoy when I am there. Even if you are not at Disneyland, I hope that these ideas give you some insights as to what other theme parks may offer or what to look for to keep your health and fitness goals in mind. Again this is just what I do and what has worked for me. If you are on vacation or won’t be back to Disneyland for a long time and you want to try all of the yummy treats and goodies then by all means, enjoy. Treat yourself. For me, I just find the experience of being in Disneyland is what I love and to be able to eat healthier options does not take away from my experience or the magic. 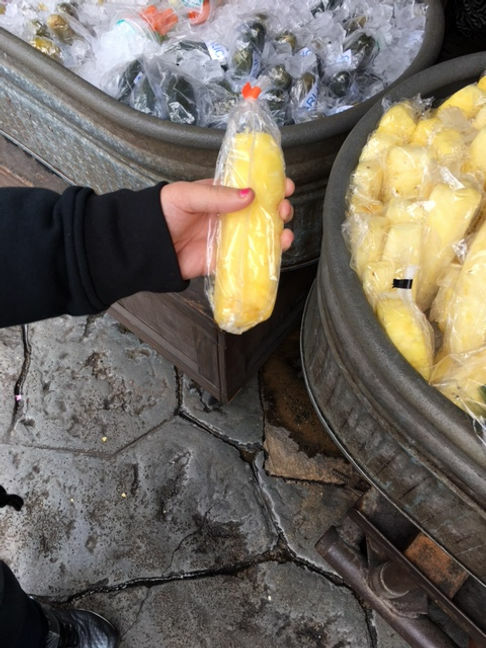 1.You can find a giant pickle in every land throughout Disneyland. Check the food carts. They even have spicy pickles now! Such a good and filling treat! THEY ARE SO GOOD! Dole Whip stand by the Tiki Room. Most of the carts that have pickles also have pineapple too. cream or candy. It is basically a milk free pineapple soft serve. You can get it with or without Dole Pineapple Juice. Seriously amazing! 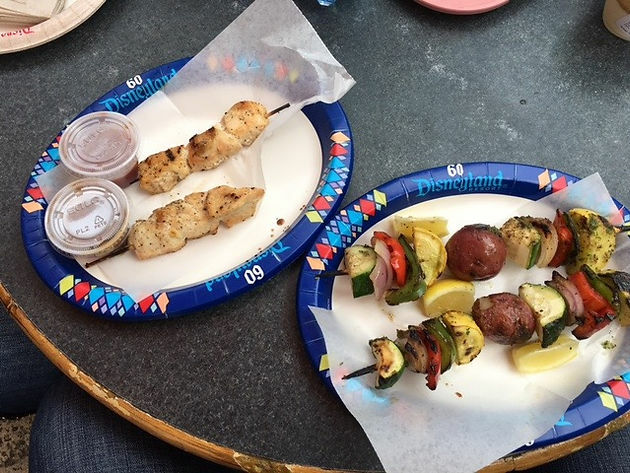 Bengal BBQ in Adventure land has some amazing skewers. My favorites are the chicken and the Veggie skewers. Ask for the sauce on the side and dip the chicken or veggies in. My mouth is watering just typing this. This can be a nice filing meal or snack. You can buy bags of apple chips at almost any food cart. These are great to snack on. (you can also bring your own too). 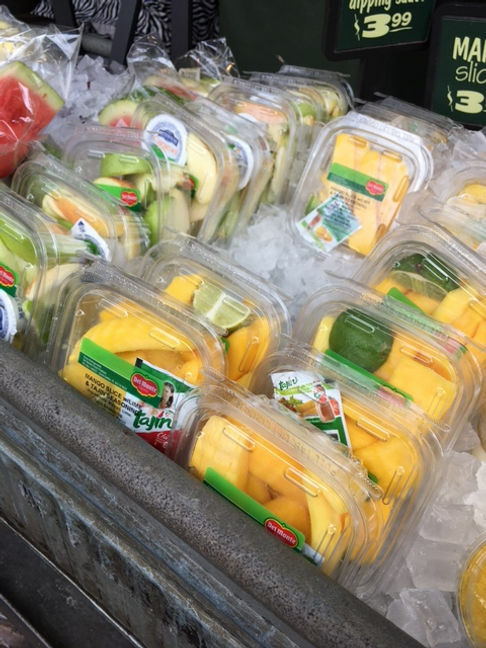 Disneyland sells a lot of fresh fruit. You can even get some at Starbucks in the park. 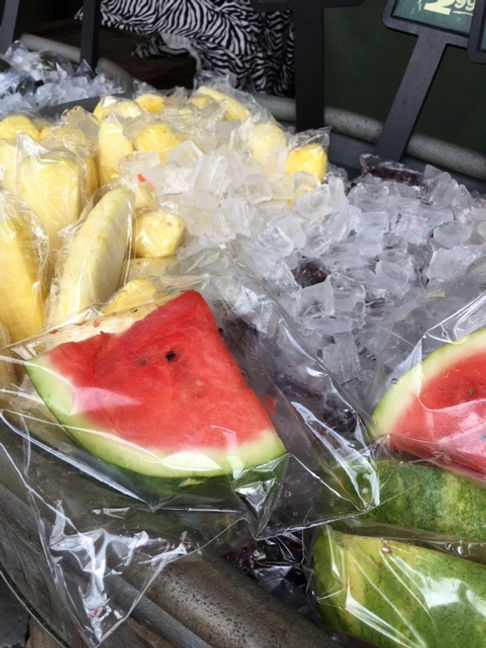 The fruit can be a little pricy but it is so good, especially when you are hungry for a little something sweet. Pizza Port in Tomorrow land has amazing salads. I know what you are thinking…salad really?! YES! When I want a little snack any of these salads definitely does the trick. They customize them too if you ask and make sure to watch out for the nuts and cheese and get the dressing on the side. This can also be a meal but makes a great snack too. You can buy sugar free candy in the shop on Main Street. They are sometimes hard to find, so if you can’t find them than just ask! Veggie sticks and ranch dressing are available on some of the food carts. The also have Peanut Butter and Hummus. Ok to be honest I have never had this because well…meat on the bone. Eating it like this does not sound appealing to me, however I have heard they are amazing. It is a great way to get some protein in and have a little snack while waiting in line. Make sure you drinks lots and lots of water! When you are walking around and waiting in line and hot it is easy to confuse hunger with thurst. Stay hydrated! You can get free cups of water at any food counter. Please let me know what your favorite snacks at Disneyland are, healthy or not, I would love to know. If you try any of these treats out, be sure to tag me so I can see. 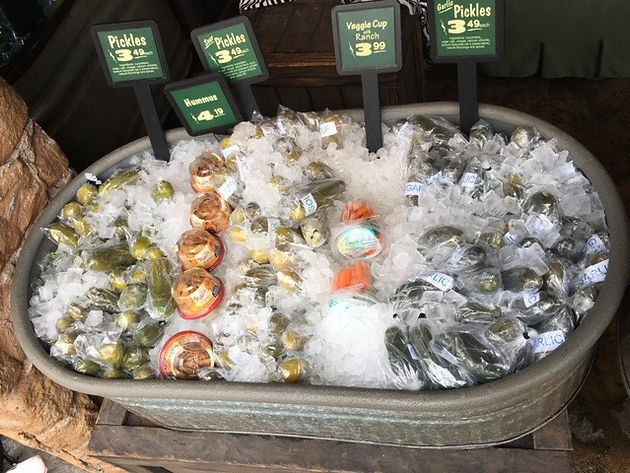 Personally the pickle and Bengal BBQ are my favorite Disneyland treats! 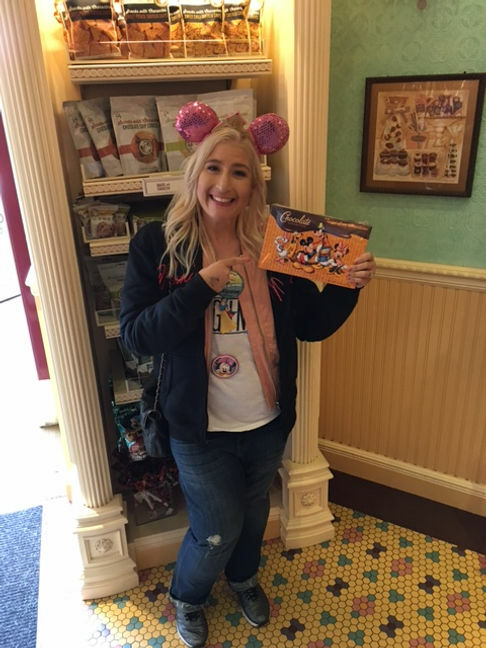 I hope you enjoyed my favorite healthier Disneyland treats and snacks! Hope you enjoy these little pieces of Disney Magic! 3 Months Post Skin Removal Surgery 2 update.